Yup, it gets worse. Michigan extended their losing streak to four games--and their winless streak to six--by falling to Union at Yost by a 6-3 margin. Union jumped out to a 3-0 lead in the first period and a 4-0 lead early in the second. Michigan drew back to within two on goals by PDG and Wohlberg, but Union scored the next two. Guptill popped one in late. From what I understand, it was a pretty impressive performance if you are impressed by the other team getting breakaway after breakaway. It sounded like an all-around poor performance and Union made them pay. On the bright side, Carl Hagelin doesn't look like he wants to go back to the AHL anytime soon. Our super-Swede now has 1-2--3 in three NHL games. (There's still about 6 minutes left in his game tonight.) He added an assist against the Penguins tonight on a pretty drop pass. Ranger fans are impressed. Blueshirt Banter had his first-career goal as the highlight of the week. He had some nice things to say--including that his speed is unbelievable. Larry Brooks had an article about Hagelin as well. John Tortorella said that "he's not only playing fast, he's playing smart". Sounds like the Hagelin we know! Bork bork bork. It sounds like you weren't at the game, so I can confirm it was a sad display, particularly the first period where UM fell down 3-0. I think UM gave up 19 shots and many of them were either 2-on-1's or 1-on-0. I most weren't true breakaways, but UM would simply give up the puck and the Union player would wheel around and shoot on Hunwick unimpeded by a defender. 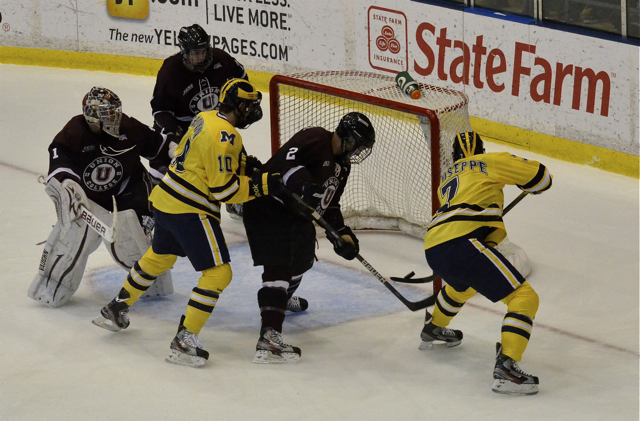 Michigan was weak with the puck, looked slow, and wasn't sharp passing. Anything can happen, but unless they REALLY turn it around starting right now (i.e., Alaska), I don't see them making the NCAAs.